I realised the other day that I was trying to hard to be awesome. And that I was so busy trying to be awesome that I’d forgotten to be wise. 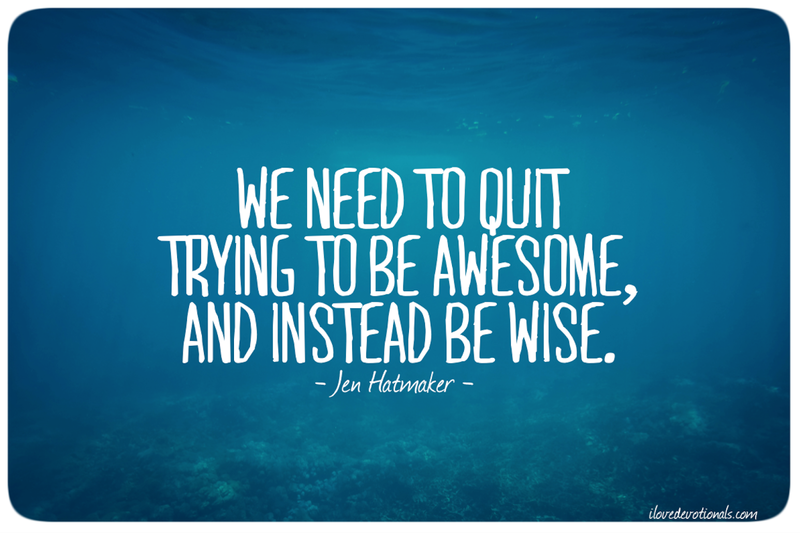 I had this moment of insight thanks Crystal Paine who wrote this wonderful blog post, Why I’m going to stop trying to be awesome. You see my husband and I are heading off for an extended period of travel (a mixture of work and pleasure) and I’ve pushing myself to schedule 10 posts while I’m away. This is of course on top of all the other last minute travel things I'm trying to get done. So this is my attempt to be wise instead of awesome. I won’t be posting a devotional every Monday and Thursday while we’re travelling but from time-to-time (if you’re a subscriber) you will find a post like this one with a few posts that I’ve loved reading and sharing on twitter over the last few months. My thought is that this blogging break for me could be a good opportunity to share some of the posts I’ve been loving over the last few months with you. And maybe even introduce you to a few new writers and bloggers at the same time. I should be back to my normal blogging routine from 22 October. It might even resume earlier depending on how long I take to recover from jetlag. In the meantime here are a few good reads for anyone who wishes they were the one getting on a plane and going somewhere (anywhere) else. Packing my bags when I need to stay by Renee Fisher // Because decades may pass while we wait on the Lord. And we’re not alone in feeling stuck. Heresick by Sarah Thebarge // Because sometimes we all need a made-up word to describe how we feel when God asks us to stay in painful places. Sarah calls it Heresick. When Your Pants and Your Life Don’t Fit by Abby Norman // Because sometimes we all need permission to grow out of things and to change in ways we never thought we would. Rest as transformation by Rebecca Laramée // Because there will be days (okay, maybe months) when you’ll need to give yourself permission to rest.